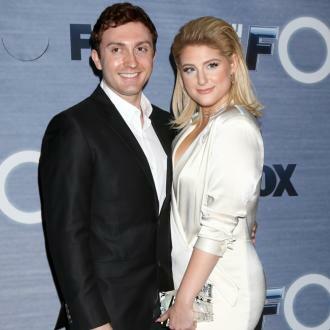 Meghan Trainor has admitted she still doesn't feel famous and that her family keep her grounded. Meghan Trainor still doesn't feel famous. The Grammy-winning pop star's first hit 'All About That Bass' reached number one in 58 countries in 2014, and became one of the best-selling singles of all time, with worldwide sales of 11 million copies as of December 2014, but the 24-year-old beauty admits it's still all surreal for her and that her family have helped keep her grounded. Appearing on UK TV show 'This Morning' on Thursday (15.03.18), Meghan - who was joined by fiancé Daryl Sabara, her parents and brother in the studio - admitted: ''It was all scary and it still hasn't really hit me. ''I don't feel famous even though we are on TV and that is crazy. The 'NO' hitmaker recently returned with new single 'No Excuses', and has been open about her battle with anxiety which she overcome to make new music. Speaking about the track, she said: ''I realised I don't have a sassy song so I wrote that last. ''I had a personal experience and I wanted to write something I haven't written already, a concept I haven't done yet. ''I felt like man, you know what I miss? 'R-E-S-P-E-C-T? Aretha Franklin. Meghan was in a dark place after having vocal surgery and experienced a real low period at the 2017 Grammys, but she says her fiancé Daryl helped her through the tough times. Asked about the ups and downs of her career, including being forced to cancel her 2015 tour to undergo vocal surgery, she said: ''It's crazy being so open about it, but it really helps. ''After going through my second surgery, I felt like man every album I do I am going to have surgery. ''The saddest part was the day of the Grammys, a year after I won my Grammy. ''Everyone in life goes up and down and that was my moment, here it is, we are going down for a minute.